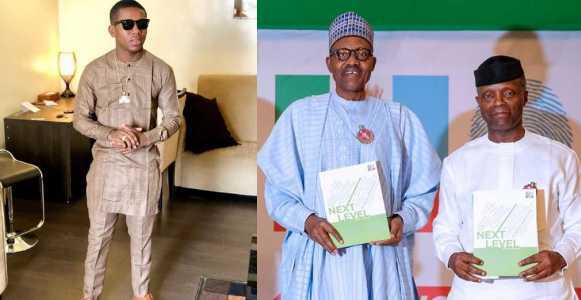 Singer Small Doctor Endorses Buhari-Osinbajo Re-election – Small Doctor, a vocalist famous for his hit tune ‘Penalty’, has supported President Muhammadu Buhari & Vice-President Yemi Osinbajo. The artist, genuine name Adekunle Temitope, made the support on his official Instagram account on Saturday. He likewise posted an animated clip. He clarified that he was exited to support Buhari & Osinbajo after a meeting with Buhari-Osinbajo South West Support Group (BOSWG), driven by Temilade Okesanjo, a public relations master. Buhari & Osinbajo are looking for re-appointment on the stage of the decision All Progressives Congress (APC). The performer conveyed the song & beat of his hit melody, Penalty, to endorse the pair who he credited for battling fraud & advancing Nigeria. “After meeting with the BOSWG, I believe we should stand up for what we believe in. We all should support and re-elect President Buhari,” he posted alongside the animated clip on Saturday morning. Apart from embracing Buhari, Small Doctor asked Nigerians against selling their votes. “If you no vote Buhari, hide your face, won ti gba opposition lo throwing,” he said in the tune.